A surprising cookie combination full of familiarity with a bit of intrigue. 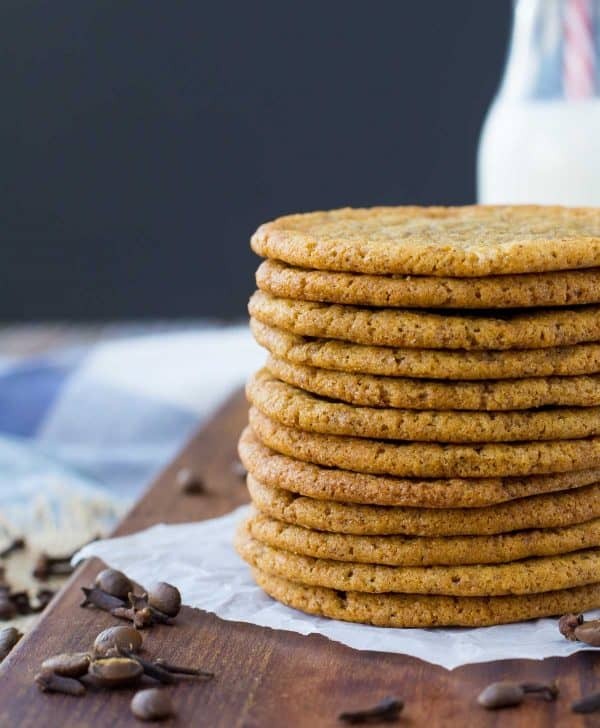 The crispy edges and soft chewy middle make these coffee cookies with clove absolutely irresistible! While my little man is at preschool for two hours, twice a week, I go to the club and party. No wait, that doesn’t even sound fun at this point in my life. I go home and nap. Nope, that’s not right either, although it sounds delightful right about now. I work. Because I run a business and don’t have a nanny. And honestly, those 4 hours are changing my life. Maybe that’s a bit extreme, but it is absolutely amazing what you can conquer in two hours without a small child (or two!) at your feet. 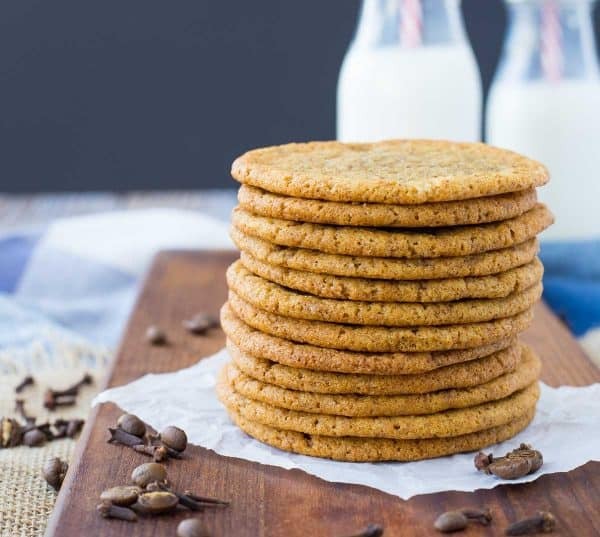 Two days ago, I baked these coffee cookies with cloves. Actually I made the dough a day in advance and then baked them over about 3 hours. Taking frequent breaks for puzzles, legos, etc. This is what life looks like as a mom. Things always take longer. Which I love, but what I potentially love even more is two hours of uninterrupted time. Then when I’m home with my little man, I don’t have to interrupt the Lego action to throw cookies in the oven or run up to my “studio” to photograph said cookies. So for two hours a day, twice a week, I head to a coffee shop down the street from my son’s school. For my west Michigan friends, it’s Jam ‘N Bean, and it’s fantastic. They have three locations and they roast their own beans and make the best juice and smoothies, too. As I write this, I’m sitting with headphones blaring music and a hot latte at my side and I gotta say, I’m a happy girl even though the latte is non-fat. Making room for more cookies, ya know? Speaking of cookies, Jam ‘N Bean frequently has samples out of their delicious baked goods. One day they had Earl Grey cookies out (yum!) 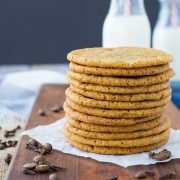 and also these coffee cookies with clove. Ever since I tasted that cookie, I couldn’t stop thinking about that surprising combination. The cloves shout “holiday” loud and clear (but not too loud) but the coffee undertones speak to the everyday familiarity of your daily cup of joe. I just had to make my own version. These cookies are flatter than many cookies and that’s partly due to the fact that there are no chunks (chocolate chips, nuts, etc). But the thin, almost lacy texture of these cookies is just right. They’re perfectly crisp around the edges and soft and chewy in the middle. Truth be told, I’d take these over a chocolate chip cookie any day of the week. I based the dough on my wildly popular M&M cookies which I’ve humbly dubbed “Perfect M&M Cookies.” The dough includes cornstarch which helps give them that irresistibly chewy texture. Even if you’re skeptical, take a chance on these. Throw a classy cookie on your cookie tray next to those green cornflake wreaths. Trust me on this one, okay? PS: How amazing would some vanilla ice cream be sandwiched between two of these cookies? 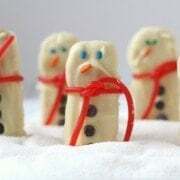 PPS: Searching for more Christmas cookie ideas? You know I have you covered. 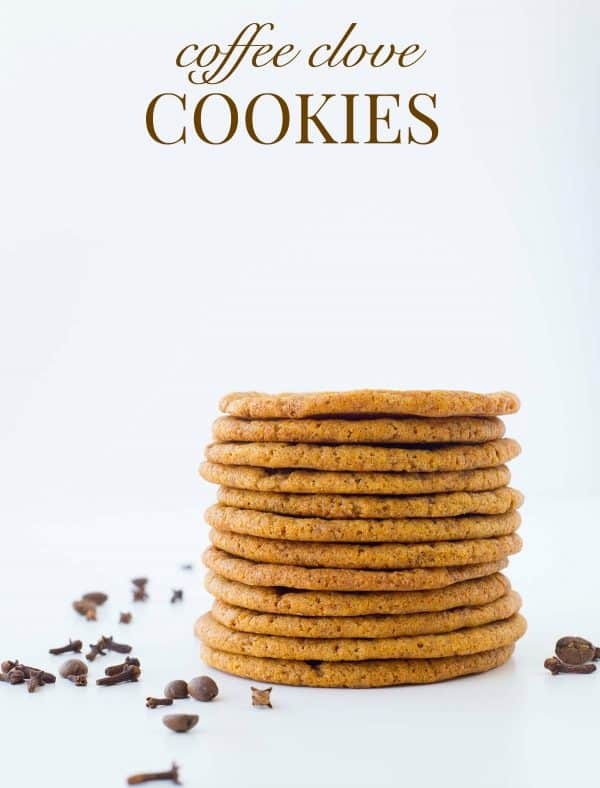 Try classic Gingersnaps, Mexican Chocolate Cookies, Easy Christmas Tree Rice Krispie Treats, Gingersnap Cookies with White Chocolate and Cranberries, Peppermint Sugar Cookies with Chocolate Ganache Filling, or browse my entire archive of cookie recipes. In a bowl, mix together flour, espresso powder, cornstarch, baking soda, cloves, and salt. Set aside. 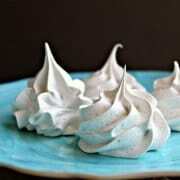 In the bowl of a stand mixer (or using a hand mixer), cream together butter and both sugars on medium speed until light and fluffy (2-3 minutes). With the mixer on low, add in egg and vanilla. Return mixer to medium and mix until incorporated. Scrape sides if needed. With the mixer back on low, add dry ingredient mixture gradually until dough forms. Refrigerate dough for at least 30 minutes or up to 24 hours. Preheat oven to 350 degrees Fahrenheit and line baking sheets with parchment paper or Silpat and set aside. Form balls from approximately 1 1/2 tablespoons of dough. Place on baking sheet — they spread a lot so don’t overcrowd, six per sheet is good). Bake for 11-13 minutes or until edges are just barely golden. Remove from oven and let cool for a couple of minutes on baking sheet before removing and placing on wire rack to finish cooling. Store in airtight container. Verdict: You guys, I’m obsessed. These might be my new favorite. Husband’s take: He hasn’t tried these yet but he’s a true-blue chocolate chip fan. I’m curious to see what he thinks of these. Changes I would make: None! Except maybe the ice cream thing. Oh I love that! Thank you SO much for leaving a comment. The Ada location is the one I most often go to, they do also have a downtown location as well as Cascade. They do their baking in Cascade I think. The Earl Grey cookies ARE good. So are the chai cookies (I think they might be chai chocolate but I can’t remember for sure). I hope you love these as much as you love the real thing! These sound amazing, so does ice cream sandwiches made with them. 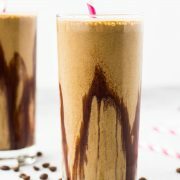 Maybe mocha ice cream or half dipped in dark chocolate. As you can tell I love mocha along with coffee. I really dislike clove & was wondering if anything could sub? I’m thinking cinnamon or nutmeg. Wonder if you agree? Thanks for a great sounding cookie. These sound great. Can’t wait to try them. Hope you put some in your freezer! Now these sound just perfect for the holidays or any time really. I am now going to try and find Expresso powder. Never heard of that, but will try and find it. 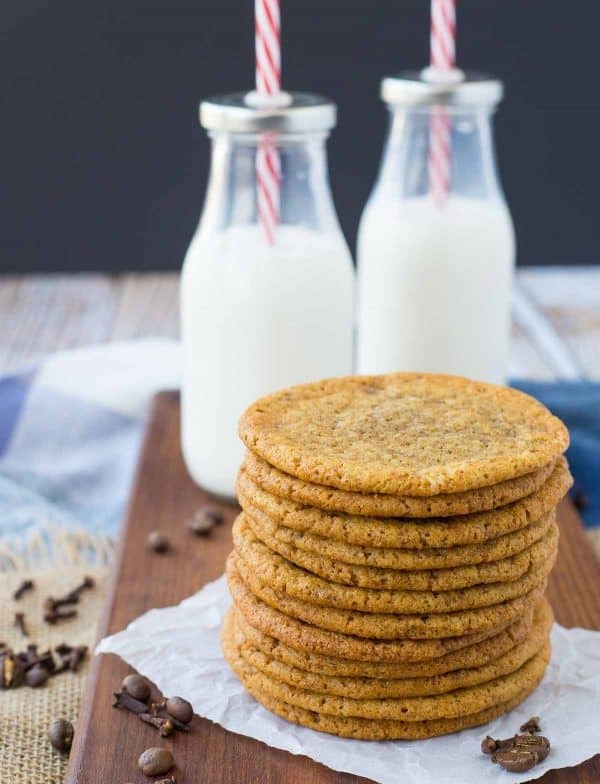 Thanks for sharing this yummy cookie with us. Ooh how awesome would these be with my morning coffee?? They look perfect for dipping!